On this day in 1863, Abraham Lincoln spoke at the dedication of the Soldiers’ National Cemetery in Gettysburg, Pennsylvania. Four months earlier Union forces had repelled the Confederate army at the Battle of Gettysburg. The three-day battle, which marked a turning point in the Civil War, remains one of the bloodiest in U.S. history. As Lincoln spoke, more than half of the Union dead remained buried in hastily dug field graves nearby. Lincoln was not the featured speaker at the dedication. That honor fell to the famed orator Edward Everett, who spoke for two hours. Once Everett finished, Lincoln spoke for just two minutes. Initial reactions to the speech were mixed. The Springfield (Mass.) Republican called it a “perfect gem.” However, Lincoln’s home state paper, the Chicago Times, declared that the “cheeks of every American must tingle with shame as he reads the silly, flat, and dishwatery utterances." The verdict of history has sided firmly with the Springfield paper. What is widely considered one of the greatest speeches ever delivered has spawned thousands of books and articles. Some analyze the five written copies of the speech and debate which wording is most accurate. Some examine the history of the speech’s writing and its legacy in U.S. history. Some look at the sources, from Pericles to the Bible, that inspired Lincoln. But, in a larger sense, we can not dedicate, we can not consecrate, we can not hallow this ground. The brave men, living and dead, who struggled here, have consecrated it, far above our poor power to add or detract. The world will little note, nor long remember what we say here, but it can never forget what they did here. It is for us the living, rather, to be dedicated here to the unfinished work which they who fought here have thus far so nobly advanced. It is rather for us to be here dedicated to the great task remaining before us—that from these honored dead we take increased devotion to that cause for which they gave the last full measure of devotion—that we here highly resolve that these dead shall not have died in vain—that this nation, under God, shall have a new birth of freedom—and that government of the people, by the people, for the people, shall not perish from the earth." 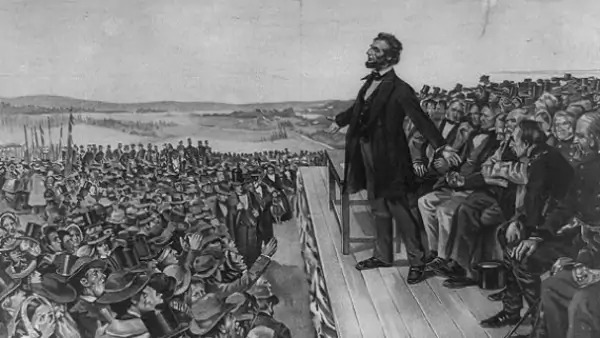 Reading that speech a century-and-a-half later, it is easy to see why Massachusetts senator Charles Sumner was moved to write that the “battle [of Gettysburg] itself was less important than the speech” that Lincoln gave. Friday File: How Good Are U.S. Universities?